A little over a year ago my husband and I were in downtown Charlotte having coffee with one of his old college buddies. At some point in the conversation, his friend pulled out a sheet of paper that looked like it had been torn out of an old book. 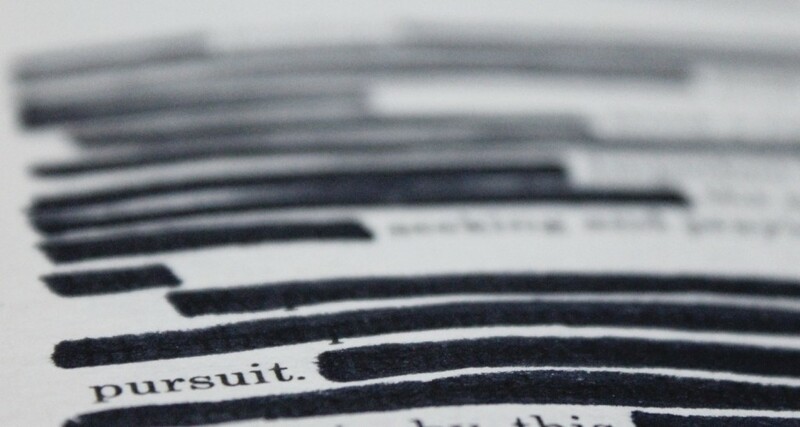 “Have you ever heard of blackout poetry?” he asked us as he showed us what was on the page. I had, but my husband had not. 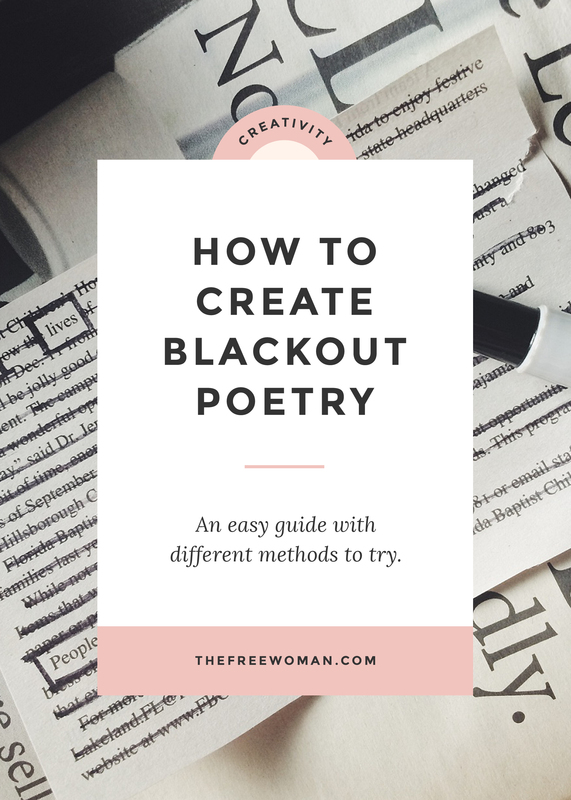 The basic concept is to take a page from a book or newspaper and create a poem by selecting certain words on that page and marking through the rest. Our interest was piqued as we read what had been extracted from the printed words on his paper. We were inspired to go home and try it out for ourselves. I knew we had an extra paperback version of A.W. 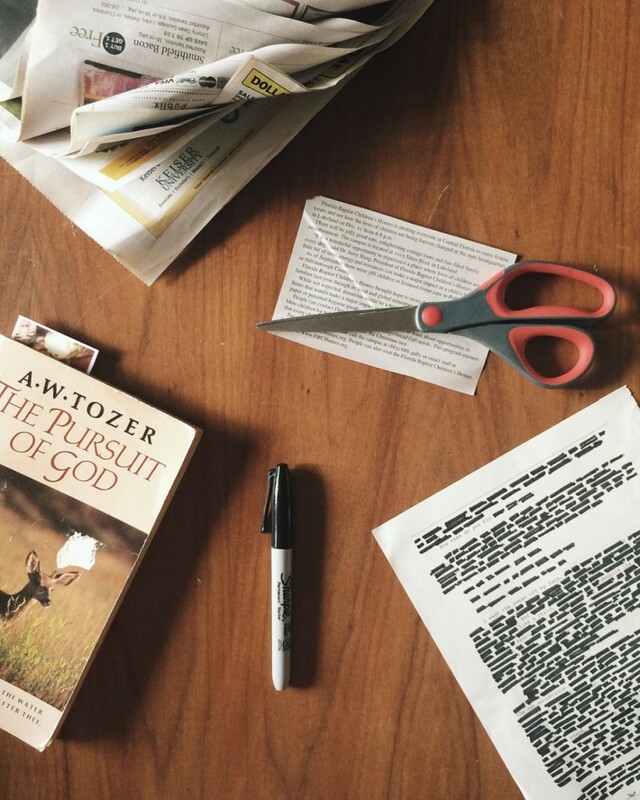 Tozer’s “The Pursuit of God” on hand, so we started with that. Thus, a series of poems which I now call “The Glorious Pursuit” were born. 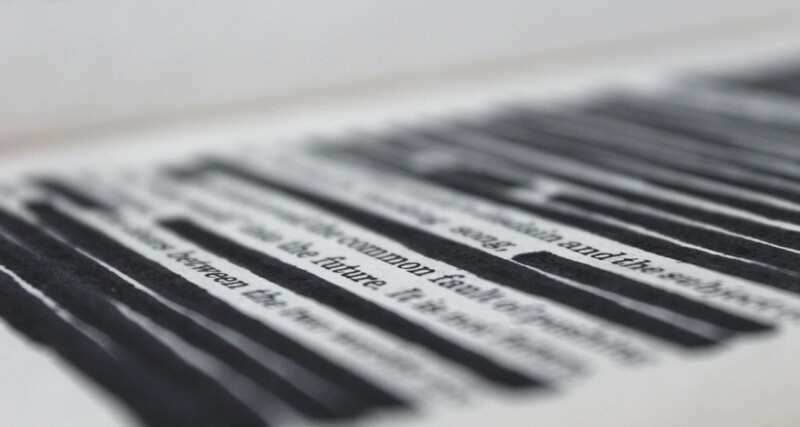 Blackout poetry is a great way to create something meaningful out of something ordinary like a brochure or article. To me, it is a great depiction of the power of one’s perspective. You can, for example, take a rather dim or gloomy article from a newspaper and, with the right choice of words, extract a hopeful message. It is also a fun challenge. Since there only a limited selection of words on any given page, we are forced to say something with what we have available. I believe that parallels into our lives on a regular basis. We are given a set amount of hours with certain resources at our disposal. We could, perhaps, be frustrated about this. Or instead, we could make art out of it. Sometimes constraints or limitations help us to be more creative and ingenious with our circumstances. 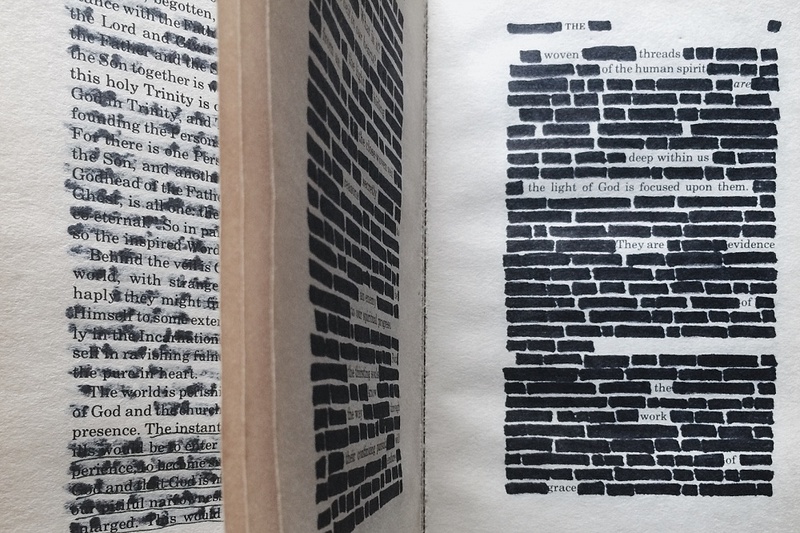 If you would like to try your hand at some blackout poetry, it is very easy! All you need is a newspaper or thrifted book… even a magazine article or brochure of some sort. Then grab some scissors and a black marker and you’re ready to begin! Scan the page that you’ve chosen to see if anything jumps out at you. Your message is not limited to the subject of the book or article. You are looking at the words as raw material to make your poem. You are making something entirely new with the “word bank” you have on that page. The result depends on which words you want to “cash out”, if you will. 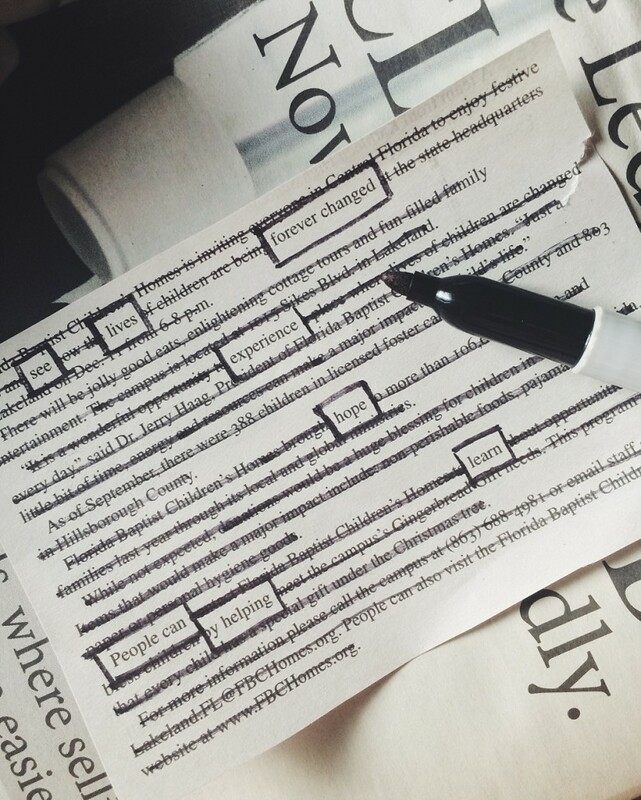 + Some people like to cross out words as they read the page for the first time, leaving words that jump out to them untouched, allowing the poem to take shape on its own. + Others like to scan for a key phrase or main idea to base their poem around and then search for words on the page that connect with it. + Once you have your poem outlined, you can blackout the extra/unneeded words with a simple line, as you have seen in these photos. However, I have also seen some extra-creative folks turn the page into a sort of illustration that enhances the imagery of their poem. Try it out! Give them all a chance and see which one you like best. Have fun with it! If you’d like to see more examples, feel free to peruse The Glorious Pursuit Series for some inspiration. Enjoy! 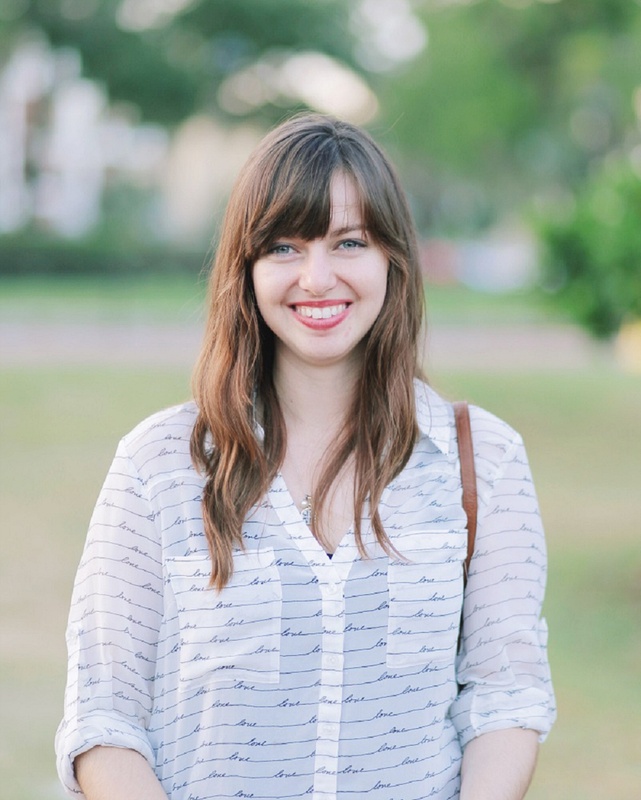 Brittany is a not-so-Southern Southerner born in SC and currently residing with her husband in Central FL. For several years she lived abroad in the Dominican Republic serving as a missionary with her family. She is a writer at heart with a love for the tangible written word. By The Sea was launched as a portfolio of her creative endeavors, featuring handmade paper, wheel-thrown pottery and blackout poetry. Follow her on social media to see what she’s been up to lately.